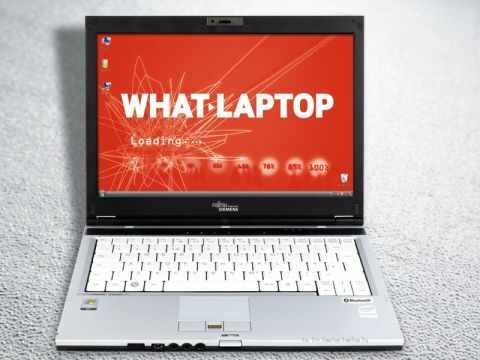 Fujitsu Siemens Computers (FSC) has struck an impressive balance with its LifeBook S6410 (£1492 inc. VAT). While it has quite a large screen, it remains ultraportable. The larger chassis allows space for a 13.3-inch screen. The extra size over its rivals is ideal for working on multiple windows and watching DVDs. The glossy Super-TFT screen also provides stunning brightness and colour, but does unfortunately increase reflections. 3D performance isn't as good as we'd like. The integrated Intel graphics chip provides enough power for basic multimedia use, but don't expect any gaming power. However, basic editing of photos and videos is possible. Battery life was outstanding and even performance managed to impress. The chassis is large, but weighs just 1.8kg for comfortable travel use. The 314-minute battery life means you can keep working for most of the day before recharging. The keyboard is large and comfortable to work on. It isn't as well fixed as we'd like and bounced slightly during use, but it remained responsive. A panel of quick launch keys provides instant access to essential features. You can lock your system, switch to a low power mode to save battery life, access Windows Vista mobile settings and configure data back-up options. HSDPA wireless internet access is provided by a SIM card fitted underneath the battery. Pre-installed 3G Watcher software makes it easy to not only get connected, but also toggle the HSDPA module on or off and send and receive SMS text messages. Home/office performance is average. The 2GHz dual-core processor is fast and compensates for the low 1024MB of memory. We were able to run several applications side-by-side, but noticed some system slowdown. The 80GB hard drive is poor compared to the competition. A built-in fingerprint scanner lets you secure your files with ease, to improve accessibility and protect your data in case of the theft or loss of your laptop. A comprehensive three-year warranty is included as standard. In the event of a fault, all return delivery costs are covered, as well as all parts and labour fees incurred from any necessary repairs. The LifeBook S6410 successfully combines its large screen and mid-level performance with a great battery life. Its stunning image quality and built-in optical drive make it a great choice for working and staying active on the move.